After my youngest daughter’s C6-7 spinal cord injury, we became a team. Beth, fourteen years old, tried again and again to stay afloat in the rehab pool on her own. Weeks later, she floated in the water with her arms gently waving under the surface–at a time when moving on land and pushing her new wheelchair was difficult. “I immediately loved the water and the freedom I had in it,” she recalls. Swimmers in my daughter’s S3 classification were rare, so she decided to work with a coach so she could swim all of the strokes. 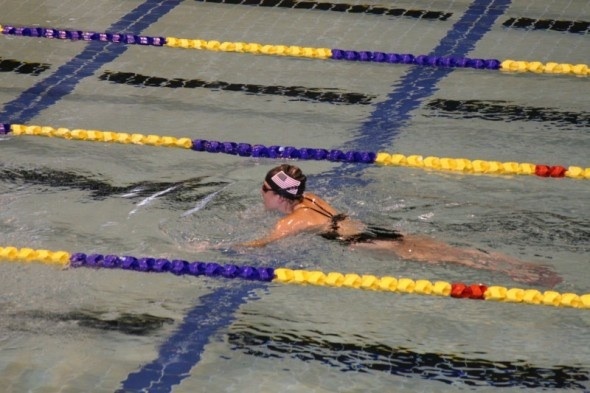 She could do the backstroke but learning to swim on her stomach—and still breathe—was the biggest challenge. It took weeks of failing before Beth figured out how to move forward on her stomach just a meter or two. Over months, she gradually extended the distance. Eventually, she learned the actual modified strokes. Venturing out of our small town of Tiffin, Ohio, Beth and I shared adventures across the country and around the world. A Paralympian, she set fourteen American Records for the U.S. Paralympic National Swim Team and the Harvard Women’s Swimming and Diving Team—the first member to have a visible disability. Eleven records still stand. Cindy Kolbe is a lifelong disability advocate who managed group homes in Ohio and ran a nonprofit in Massachusetts. She currently lives in Summerville, South Carolina. Her daughter Beth is employed as a health policy lawyer in Washington, DC. Cindy’s blog shares their adventures at Struggling With Serendipity.